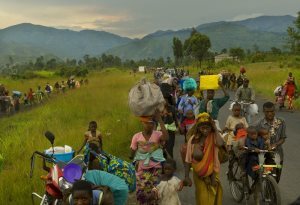 AFRICANGLOBE – The United Nations Bureau for Coordination of Humanitarian Affairs (OCHA) is deeply concerned by the consequences of recent fighting on thousands of families in the east of the Democratic Republic of Congo (DR Congo). In a press statement on Monday, OCHA said the fighting has affected the capacity of humanitarian organizations to deliver aid to the victims. The events of the last two weeks have displaced an unknown number of people and disrupted their economic activities and also led to the committing of other crimes such as sexual violence, recruitment of child soldiers as well as inter-community violence. “The recent fighting has aggravated one of the most complex humanitarian crises in the world,” the statement added. “I appeal to all parties taking part in the conflict to take precautions in order to avert any injuries and loss of lives of the civilian population, as well as attacks on non-military targets,” said Fidele Sarassoro, the humanitarian coordinator for DR Congo. Sarassoro equally urged the international partners to bring all the appropriate support so that UN agencies and the NGOs can continue distributing the aid, in spite of the operational difficulties. Since April 2012, the deterioration of the security situation due to fighting between the national army and the M23 rebels, has led to the displacement of at least 220,000 people in the North- Kivu province. 43,000 others crossed the border to Uganda and Rwanda.